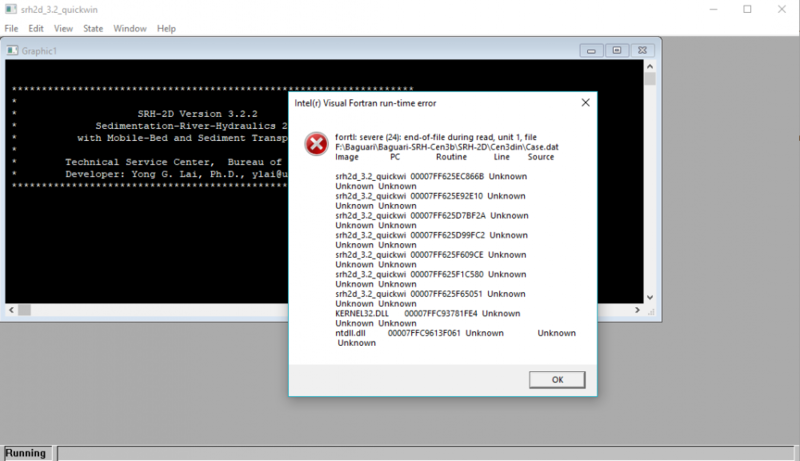 I am working in Version 12.2.11 of SMS and am running into the following error when I try to run the created simulation in SRH2D. Does anyone know of a fix for this error? This error usually indicates that something went wrong when SRH-Pre ran. 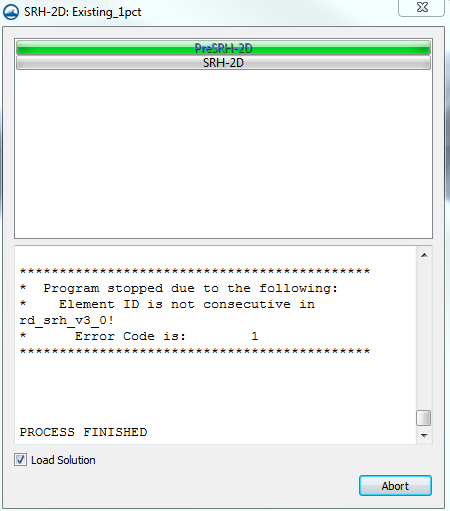 If SRH-Pre runs into an error, the simulation *.dat file is not created and when SRH-2D tries to run, it will report that it cannot find the file (the error shown in your screenshot). There is usually a more descriptive error in the SRH-Pre model wrapper window. Have a look at the SRH-Pre error and refer to the SRH-2D error wiki page for a description and resolution. If that page is not much help for the error you see, please post the error you are seeing along with any information about your model that may help to identify the issue. Thanks for the quick reply. I was in fact getting the error message below in the SRH-Pre run and was able to resolve using the wiki page. Thanks again or your help. * Time_Series data file does not exist! The point is that I'm running a steady state simulation, with automatic initial condition (I've done some simulation using this initial condition and they were alright). I've tried remaking the mesh, the boundary conditions and the materials information, but with no success. EDIT: Actually, I can run the model with subcritical inflow but when I change to supercritical, the error message appears. Does anyone have a clue about this? I've consulted the SRH-2D error wiki page but there's no explanation about this error message. *Time_Series data file does not exist! I even got rid of the unsteady boundary conditions and tried to run the model in steady mode (thereby eliminating the need for a time series), but I still get the same error. SRH-2D model files are attached, if that helps. Problem solved for steady state run. SMS fixed this bug in version 12.2.8 (june, 2017), I've downloaded latest version (12.3) and the model is running OK.